Getting ready for your first trip to Gatlinburg or Pigeon Forge in the Great Smoky Mountains of Tennessee? Don’t worry – we’ve got you covered. 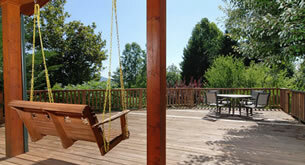 We’ve been managing vacation rental cabins, exploring, living in, and loving the Smokies for a long time. We LOVE the attractions, the cozy cabins, the gorgeous scenery, the annual events, the variety of food, the music…well, EVERYTHING about the Smoky Mountains! We’ve also spent a lot of time playing tourist, so we know the ins and outs of vacationing here too. So if you need some tips for getting around Gatlinburg, ideas on what to do and eat while you’re here, or a list of where to shop and explore, we have it all. Read on for your easy and quick Beginner’s Guide to Gatlinburg! Navigating Gatlinburg and Pigeon Forge can really be quite easy – if you know what to do. Luckily, you have several options for getting around Gatlinburg too. If you’ll be driving your car or a rental car, be sure to check which events will be happening during your stay so you can prepare for traffic and decide when you’ll be getting out and about. Traffic lights are numbered along the Parkway (the main strip through Gatlinburg and Pigeon Forge), so it’s easy to know where you’re going. Many attractions, restaurants, and shops are peppered in plain sight along the main roads, so driving along and deciding what you want to do as you go is easy as well! If you don’t want to do your own driving, no worries! The Gatlinburg and Pigeon Forge Trolleys make navigating the Smokies so much easier! They’re also very budget friendly, with fares starting at just $0.50. The trolleys (Gatlinburg Trolley and Pigeon Forge Fun Time Trolley) have tons of stops at major attractions and areas in the Smokies, so it won’t be hard to use this as your main source of transportation if you’re doing a lot of exploring downtown. Of course, you can always park your car and walk in Gatlinburg, because so many activities are right next to each other along the Parkway. Places like The Island in Pigeon Forge and The Village Shops in downtown Gatlinburg can provide hours of fun – all while walking around! The Gatlinburg Convention and Visitors Bureau has an app that makes Smoky Mountain vacations easier. It’s free and features info about events, attractions, restaurants, maps, and more. You can also check out our Cabins for YOU blog for more information about everything you could want to know about the Smoky Mountains! We have new ideas, tips, and cabin updates each week, so always check back for something new! Southern comfort foods are a staple in the Smokies, so BBQ, mac ‘n cheese, fried okra, mashed potatoes, apple fritters, and delicious pies are a must if it’s your first time here. But food goes way beyond that in Gatlinburg and Pigeon Forge. You can take your pick from German, Italian, burgers, Mexican, Asian, and more. There are also plenty of delicious desserts, including decadent fudge, old-fashioned candy, chocolate-dipped strawberries, lots of ice cream, and more. Outdoor gear, mountain-themed décor, wood carvings, leather goods, beautiful art, As-Seen-On-TV items, toys, brand-name merchandise…you can find anything in the Smokies. Here are some top spots to shop in Gatlinburg and Pigeon Forge. We have 350+ cabins in Gatlinburg and Pigeon Forge to choose from, offering cozy 1-bedrooms cabins for couples, 2-3 bedrooms with a little more space, spacious family cabins, and large-group lodges for reunions and retreats! Browse by amenity, and take your pick of private indoor pools, game rooms, theater rooms, fully equipped kitchens, community amenities, mountain views, hot tubs, and more!